Through his first two seasons in the British Columbia Hockey League, Newhook has made sure to leave an impression. In 2017-18, he had 22 goals and 44 assists through 45 games and was awarded Rookie of the Year. He was also named to the First All-Star team and the Rookie All-Star team. This season has been even better as he put up an astounding 38 goals and 64 assists in just 53 regular-season games. He became the first player since Tyler Bozak in 2006-07 to hit 100 points in one season. He also reached the milestone in impressive fashion. With just two games remaining in the regular season, Newhook had a hat trick and five assists. After his impressive season, he was awarded the Vern Dye Memorial Award, given to the BCHL’s most valuable player of the year. That is on top of the Brett Hull Award, given to the player with the most points in the regular season. Growing up in Newfoundland, Newhook was tearing up the leagues there when he realized he needed more competition. He moved to Toronto, which seems to have paid off. Playing for the York Simcoe Express AAA club, he put up 74 points in 33 games and was then drafted into the QMJHL by the Halifax Mooseheads, 41st overall. He opted to go the U.S. college route, turning down the QMJHL and headed to the BCHL instead. He then committed to Boston College for the 2019-20 season. If there’s one player who could surprise everyone and jump up the board during the 2019 NHL Entry Draft, it’s Newhook. He’s projected in the late teens, but I could see a team higher up take a chance on Newhook. I could see him just getting into the top-15 and I have him going with the 15th pick. There’s no doubting that Newhook will be an NHL contributor. He already has the skating ability, puck mobility and the hockey IQ to make an impact. He should be a top-six forward in the league, possibly as early as the 2020-21 season, but it could be the following season. 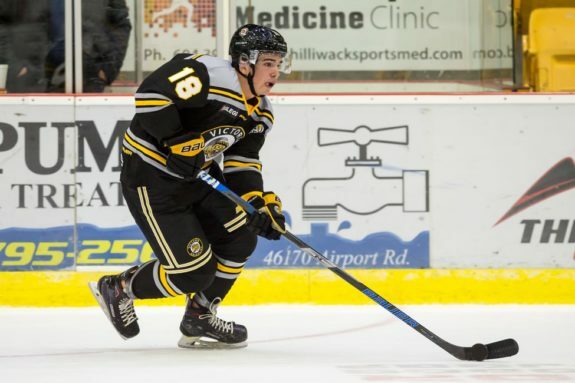 Newhook has been a point-scoring machine since entering the BCHL. In his 2017-18 rookie season, he had the most assists (44) and points (66) as a rookie, being named to the BCHL All-Rookie Team and the First All-Star Team. He was also named Rookie of the Year in both the BCHL and the Canadian Junior Hockey League. In 2018-19, he had the most assists again (64), winning the Brett Hull Trophy as the top scorer in the BCHL and the Vern Dye Memorial Award as league MVP.